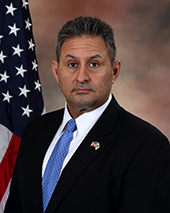 Michael Carvajal is the Assistant Director of the Correctional Programs Division. Mr. Carvajal began his career with the Bureau of Prisons in 1992, as a Correctional Officer at FCI Three Rivers (TX). He served in positions of increasing responsibility, including Employee Development Specialist and Lieutenant at FCI Three Rivers; Captain at FCI Texarkana (TX) and USP Leavenworth (KS); Correctional Services Administrator for the South Central Region (TX); and Associate Warden at FCC Beaumont, serving at both the USP and the FCI. He also served as Warden at FCI Texarkana (TX), and Complex Warden for FCC Pollock (LA), before being promoted to Regional Director for the Northeast Region in July 2016. Mr. Carvajal assumed his current position as Assistant Director for the Correctional Programs Division on August 19, 2018. As Assistant Director, Mr. Carvajal is responsible for a wide variety of areas, including designations and sentence computation, the Witness Security and Victim-Witness Programs, security and emergency planning, inmate transportation, unit and case management operations, and oversight of 11 private correctional facilities under contract with the Bureau. He also directs the agency's intelligence efforts that require coordination with law enforcement agencies around the country. Before joining the Bureau of Prisons, Mr. Carvajal served in the United States Army for four years and attended Bee County Community College. He has been a member of the Senior Executive Service since 2013.